The parish of Woodbastwick is situated in the Norfolk Broads. It lies north of Blofield and Hemblington, west of South Walsham, east of Salhouse and south of Horning. The name Woodbastwick derives fro the Old English meaning ‘Bastwick Wood’. The parish has a long history and was established by the time of the Norman Conquest. Its population, land ownership and productive resources were detailed in the Domesday Book of 1086. This document revealed that the Benedictine Order at Holme held land here. The rest of the entries concern agricultural resources, with several sheep being mentioned. The modern village is very picturesque with many buildings thatched with the reeds from the marshland. A good number of the archaeological records for Woodbastwick concern the prehistoric period. The earliest site to be reported is a Mesolithic flint working site, identified by the sheer number of lithic tools found at this spring side location (NHER 8473). The subsequent Neolithic period is well represented by flint tools, which tend to take the form of polished axeheads (e.g. NHER 8420 and 8421). Other artefact types from this period include an adze and quern stone (both NHER 20540). The busiest period of prehistory in Woodbastwick is the Bronze Age. Aerial photographs of the parish show the cropmarks of numerous ring ditches (e.g. NHER 16734 to 16736) dotted across the landscape. A large number of Bronze Age artefacts have also been recovered. The most exciting of these was a hoard of palstaves (NHER 29362) from the middle part of this era that were discovered in 1993-94. Other finds comprise flint arrowheads (NHER 8475 and 25256), copper alloy axeheads (NHER 49802), socketed axes (NHER 8478) and individual palstaves (NHER 8422 and 8477). Sadly, rather less has been recorded for the Iron Age. A couple of possible late prehistoric enclosures (possibly Iron Age or earlier) have been noted from aerial photographs (NHER 13102 and 49414), but few definite sites are apparent. Finds consist of objects like pottery sherds (NHER 44133) and terrets (NHER 49802). Rather more evidence exists to attest to Roman activities in the parish. The cropmarks of a large rectangular enclosure and associated ditched boundaries, all probably Roman in date, are visible on aerial photographs to the southwest of Ranworth Priory. Finds of a Roman date have been found within this general area (NHER 28942 and 28943). As such, it is possible that this site represents a small Roman settlement or farmstead (NHER 11726). The remnants of other possible Roman field systems and boundaries have been reported (see NHER 13102, 49411 and 49424), and this suggests that the fertile land of Woodbastwick was being exploited for farming during the Roman era. It is also worth noting that a possible iron-working site (NHER 8482) was discovered in 1959 when ploughing unearthed a large mass of iron slag along with an iron mattock head and fragments of a bronze cauldron in one of the fields. A subsequent excavation in the same year found more cauldron fragments and slag. As is often typical the majority of the small finds from this period are coins (NHER 8503, 18172 and 28943), many of which were discovered through metal detecting. However, the low quantity of metal objects across the parish seems to indicate that the parish was a very rural area at this time. No Saxon sites or monuments have been reported in Woodbastwick. Only a limited number of finds have been retrieved and these include an Early Saxon spearhead (NHER 8448) along with sherds of Middle Saxon (NHER 29362) and Late Saxon (NHER 13861 and 30898) pottery. The modern parish of Woodbastwick includes three villages: Panxworth, Ranworth and Woodbastwick itself. As such there are three medieval churches to discuss. St Fabian’s and St Sebastian’s Church (NHER 8435) in Woodbastwick is unique in England for its dedication. The church has medieval origins (14th century) but was extensively restored in 1878-79, with the flints used in this restoration knapped at Whitlingham. St Helen’s Church in Ranworth (NHER 8515) is mainly in the Decorated style (about 1290-1350) but was altered in the Perpendicular period (about 1350-1530). It contains exceptional examples of woodwork including the finest rood screen in Norfolk, dating to 1419. 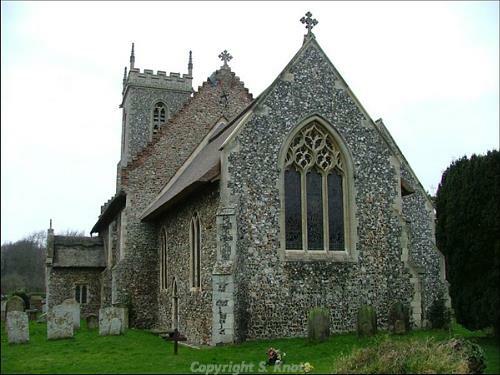 Unsurprisingly this church is one of sixty-five Norfolk churches selected amongst the 1000 best churches in England. The former All Saints’ Church at Panxworth (NHER 8501) had a Decorated west tower with flushwork battlements. It was derelict by 1969 and was mostly demolished in 1981, with only the tower left standing to mark the site. The archaeological records show that during the medieval period Woodbastwick was involved in pottery production. A possible manufacturing site has been noted in Blackhill Wood (NHER 1076), with a large number of pottery sherds and pieces of kiln waste being recovered from the ground surface. In addition to this site, several other possible kilns/firing hearths (NHER 8435 and 8495) have been reported. Another activity conducted by the parishioners in medieval times was peat cutting. Woodbastwick has several broads running through it, namely Sotshole Broad (NHER 13516), Decoy Broad (NHER 44121), Salhouse Broad (NHER 44124), Cockshoot Broad (NHER 44127), Ranworth Broad (NHER 44128) and Malthouse Broad (NHER 44129). All of these would have been exploited for the valuable peat for use as fuel in domestic and craft contexts. No medieval manorial sites have been definitively identified. However, a possible moat and associated linear features exist at Mouseholdheath Farm (NHER 29467) and these features could relate to such a site. Despite the lack of medieval domestic buildings, it is worth noting that 17th century Ferry Farm (NHER 20962) has reused medieval stonework and that Old Hall (NHER 38134) incorporates limestone blocks from St Benet’s Abbey (NHER 5199). All the medieval small finds from Woodbastwick are typical everyday objects. These include coins (NHER 13861 and 49078), pottery sherds (e.g. NHER 13862), a cloth seal (NHER 28942) and a cauldron leg (NHER 28943). During the post medieval period a number of fine buildings were constructed in the parish. Woodbastwick Hall (NHER 8430) was situated on the site of an earlier hall that was demolished after being burnt down 1882. Ewan Christian built it in 1889 in an Elizabethan style with off-centre tower and red brick exterior. Sadly, the Hall was demolished in 1971 and a fireplace from it now resides in Channonz Hall in Tibenham (NHER 10937). Similarly, the 16th/17th century Ranworth Hall (NHER 14448), which stood near to Cockshoot Broad, no longer survives intact. It was largely demolished in 1985 and the only testament to its former presence is the porch. Intriguingly, Old House (NHER 13449) was marked as Ranworth Hall on the Ordnance Survey, although it is difficult to confirm this assertion. However, many of the typical dwellings from this period still remain. As mentioned earlier many of these have thatched roofs, giving the village a pleasant rural feel. These properties include Sotshole Cottage (NHER 20964) and Street Farm Barn (NHER 45940), the latter of which dates to the 18th century and features sections of chequered brickwork. It is also apparent that a number of mills were in operation in the post medieval era. Various types are recorded including a watermill (NHER 15619), a windmill (NHER 15972) and a post mill (NHER 11872). The remains of Ranworth Hollow Post Mill (NHER 23358) can be seen on aerial photographs taken in 1994 as well as at ground level, with the brick supports for the mill still surviving. Of course land drainage was important at this point, and the records for Woodbastwick report at least one post medieval drainage pump (NHER 8516). That is not to say that the peat resources provided by the Broads were not still being utilised, as evidenced by two peat cutting sites (NHER 49291 and 49292). Other industries present include brickworks (NHER 15939) and an ironworks at Panxworth (NHER 14470). The building of the former ironworks still survives and this long, red brick building is dated to 1869 on the west gable. The works closed in 1889 and on the south side of the road was a windmill, which was replaced by a steam mill in around 1880 when it was damaged by a gale. Metal detecting and fieldwalking have served to recover a number of post medieval artefacts. In spite of this, the most interesting collection of objects was found during renovations at the Old Vicarage (NHER 46091) on Woodbastwick Green. The objects recovered included ceramic vessels dating to 1790, part of a clay tobacco pipe, two cartwheel halfpennies, the bones of several rats and a cow, a small wooden box, a mid 18th century shoe and pieces of leather and wall paper. It is possible that these items were materials used for a ritual purpose (i.e. witchcraft). Common objects such as coins (NHER 13862), jettons (NHER 49801) and spurs (NHER 28943) comprise some of the other finds. Two World War Two sites have been reported for Woodbastwick. One of these is a bombing decoy (NHER 28451), which was located somewhere in the Ward Marsh area. The decoy was made to look like an industrial area and was supposed to imitate Norwich. However, it was only used during November 1941. The other site takes the form of a military training area on modern Honeycombe Road (NHER 45136). The earthworks of this site, now known as the Brakes, were visible on an aerial photograph taken by the RAF in 1946. The most recent records for the parish concern the wrecks of boats in the Broads. At the south end of Ranworth Broad, by the floating conservation centre, are at least three wrecks (NHER 44131). These are supposedly wherries that were sunk in around 1960 to prevent bank erosion. Another wreck has been located in the southeast corner of Salhouse Broad (NHER 44132), and this was visible on an aerial photograph taken in 1946. As such it is quite possible that it may have formed part of an obstruction to prevent enemy seaplanes landing on the Broad during World War Two. Thomas Sunley (NLA) 18 September 2007.